Aquí podeu consultar la llista d'alumnat seleccionat per gaudir d'una beca Erasmus + durant aquest curs acadèmic. Here you can take a look to the list with the selected students that will be able to enjoy a Erasmus+ grant during this academic year. A aquest document podeu llegir la convocatòria de beques ERASMUS + disponibles pel curs 2014-2015 així com les condicions, criteris, plaç, .... que la regeixen. Pensau en entregar el curriculum vitae i la sol·licitud abans del 4 de desembre a la secretaria del centre si sou alumnes de segon curs d'un CFGM (la llista d'admesos es publicarà el dia 11 de desembre) o bé teniu fins dia 12 de desembre si sou alumnes d'un CFGS o de primer curs d'un CFGM (la llista d'admesos es publicarà el dia 22 de gener de 2015). 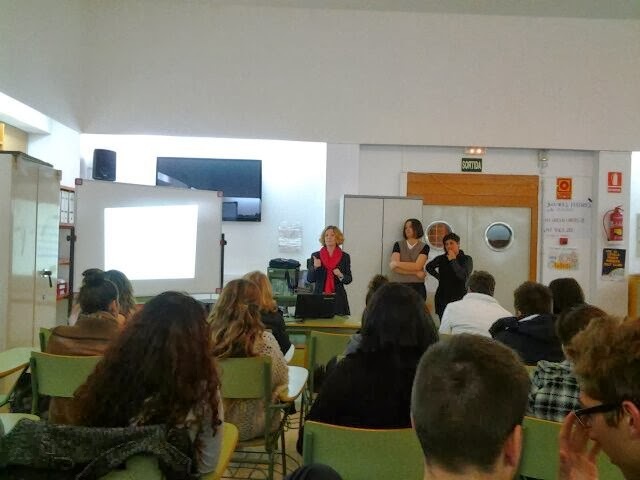 You can read all about ERASMUS + grants in our school for the academic year 2014-2015 here. Don't forget to bring your cv and the application form before 4th. december if you are a second year CFGM student (the final list will be published on the 11th. december) or before 12th. december if you are either a CFGS student or a first year CFGM student (the final list will be published on the 22nd. january). Per tal de consultar la correspondència de crèdits entre els CFGS i els estudis universitaris de grau, clicau aquí. In order to consult the credits correspondence between Advanced Degree Training and University degrees take a look ath this link. Ja tenim el llistat d'alumn@s que han presentat les sol·licituds bé per aquest curs o bé pel següent. Si clicau aquí podreu veurer-lo. Si trobau que hi ha alguna errada, per favor consultau amb nosaltres. Així mateix, podeu consultar el nou calendari on figuren les dates de les reunions, entrevistes, ... Les entrevistes i les proves només són pels alumn@s que s'hi presenten per fer les estàncies durant aquest curs acadèmic. We already have the list with the students who have presented the applications either for this academic year or for the next one. You can have a look at the list here. If you find any mistake, please let us know. You can look the new calendar up, where there are the specific dates for meetings, interviews, .... These interviews as well as the tests are only for the students who want to enjoy the training programme this academic year. A aquest enllaç de la Conselleria d'Educació, Cultura i Universitats trobareu tota una sèrie de recursos lingüístics molt útils i també per tal de redactar el vostre C.V. així com d'altres. Aquest altre enllaç vos redirecciona a la pàgina web de la Comissió Europea sobre educació i formació. Clicking on this link you will be addressed to the Education Balearic Goverment web page where you can find very useful linguistic resources, advice to write your C.V. as well as some other ones. This link will take you to the Education &Training web page of the European Comission. Per tal d'informar sobre les diferents opcions de les beques de mobilitat i donar a conèixer les experiències d'alumnes que ja les han gaudit, es varen realitzar una sèrie de xerrades als alumnes de Cicles Formatius. Aquí vos deixam unes fotos. 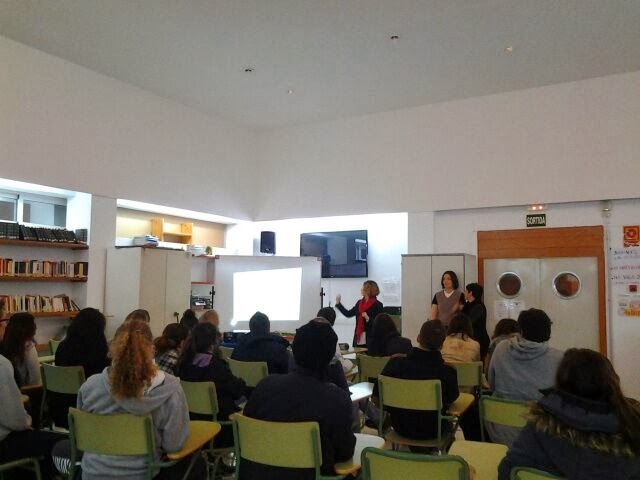 In order to inform about the different mobility grant possibilities and to make students' experiences known, a number of talks were given to the other students. Here you have some of the photographs taken during the talks.